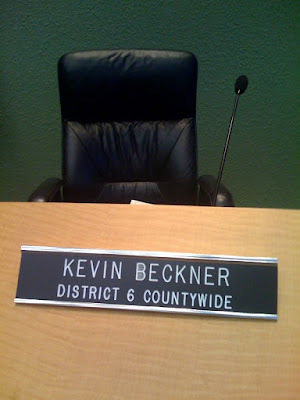 I attended the Swearing In Ceremony for Kevin Beckner, an openly gay Democrat who defied the odds and defeated an entrenched homophobic Republican. Many of us have been in those county commission chambers numerous times to protest the repeal of the human rights ordinance, the passage of the mean spirited, gay pride ban. Hillsborough County had earned an international reputation for homophobia but now had elected a proud and openly gay man by a decisive 50,000 votes. Before we stood in front of a commission unwilling to even listen to their constituents, unconcerned about the cruel impact of their actions. But today we were there to celebrate. One person said to me, "I can't believe I'm in this chamber and I'm smiling." The crowd overwhelmingly cheered, applauded, some wiping away tears. Volunteers from across the county, old and young, of every race, ethnicity, religious background, sexual orientation stood together. In fact, somebody who had told me years ago she could never support a gay candidate because it was against her religion made a point of letting me know she had very worked, donated, volunteered, and publicly endorsed Kevin Beckner. The most amazing moment came when Kevin thanked his partner Gil. He thanked Gil for 10 years of love and support, and for the past 22 months the sacrifice so that Kevin could dedicate all his energy towards winning. Finally he thanked Gil for his decades of service in the Sheriff's Office protecting the people of Hillsborough County. It was a beautiful moment. One that has never been seen here. We have had gay people who have run for office, we have gay people that have been elected to office, but we have never had someone who served proudly and openly and acknowledged their partner, used the word love to describe that partnership, and in doing so, shifted forever how people have to acknowledge who we are in full. It was a glorious day, a new day of possibility.